Torino Di Sangro, Abruzzo. 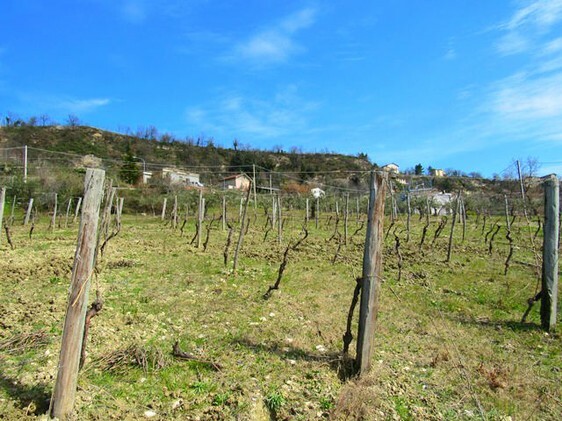 1200sqm of building land with sea and mountain views, including an olive grove. The land has a tarmac road and easy access to utilities. It is a peaceful spot close to other house but private with open, fatastic views. Building land for a Villa of 300sqm with sea view. Poggiofiorito, Abruzzo. Large old detached Italian Ruin situated in the small village of Poggiofiorito with valleys and hills views. The house is situated over two floors, with lots of character bringing the old Italian style into life. This house needs full restoration. This house could be restored into a large 4/5 bedroom house, with two bathrooms, kitchen, dining room and living room. The house consists of electricity which would need restoring, water and sewage connection. It has 500sqm garden. Poggiofiorito is a rural village situated on a hill next to the river Moro. It has around 1000 habitants. Casalbordino, Abruzzo. Building Plot located 1.5 km to the beach, offering sea view, 1300sqm of flat building plot with a ruin that can be rebuilt into a Villa of 110sqm, surrounded by traditional farm land. The property offers both sea and mountain views, located next to a quiet, tarmac, council road, with easy access to all utilities. Castel Frentano, Abruzzo. Building plot with ruin. 2 hectares of mainly crop land with ruin, peaceful. The closes house is 500 meters away. You can build around a 200sqm Villa. Lanciano, Abruzzo, 3 bedrooms. Two farm houses with 1000sqm of land, in a quiet spot 3km to the city center of Lanciano. The ground floor to the main semi-detached house is 40sqm, and not connected via interna stairs to the main house. The walls are stone, with small vaults in the ceiling, and big fireplace. Via external stairs enter the main house into the kitchen with bathroom. Up internal stairs there is a double bedroom with the possibility to open up to a panoramic terrace. Up internal stairs to a converted attic, quite low, with valley views. This could be converted into a panoramic terrace with sea and mountain views. Next to the main house is a second house of 50sqm with a flat roof. This house is mainly a rustic kitchen with basic bathroom. The main house is fully centrally heated from mains gas. The garden surrounds both properties with many fruit trees. There is a right of way between the two houses for local farmers to access their land. Torino Di Sangro, Abruzzo. Large cottage with 2000sqm of land and spacious barn, 500 meters to the beach, off the main road. This idilic position has mountain views and surrounded by vines. The property can be restructured or rebuilt to double the size.